To better understand what a T-shaped person is, it is perhaps easier to first understand what the converse, an I-shaped person, is. While there’s nothing wrong with being an I-shaped person—a functional expert; imagine a whole bunch of functional experts sitting around trying to work together. Imagine, for example, an agency environment where a web developer, an SEO expert, an analytics expert, a content developer, and an art director are all sitting in a conference room trying to develop a plan for a client’s website. The SEO expert insists that you should build the client’s site around a keyword map to make sure that the site’s structure mirrors an emphasis on keywords. The web developer insists that the site be as easy to code as possible. The analytics expert says that the new design has to be based on what the web analytics show about usage of the client’s old site. The content developer insists it’s all about developing interesting, engaging navigable content. And in the spirit of the terrible over-emphasis on creative that most agencies have; of course the art director is insisting that site composition and brand beauty is the number one goal. Which one of these I-shaped people is right? And how does it all get sorted out? Well, most agencies apply a Band-Aid… enter the referee, AKA the account manager, and let battle begin. Ok. Let’s stop right there. It’s pretty obvious that no matter how good the I-shaped functional experts described in our scenario above are at their individual functions, what they lack is not only an appreciation of their fellow co-workers’ areas of expertise, but also the training and career development perspective to actually find solutions at the intersection of their respective functional areas. Now, let’s contrast the I-shaped people above with the T-shaped person that is multi-function aware, collaborative, desirous of being wrong so that they learn, at least as often as they are desirous of being right, and are always seeking to learn more about how their function impacts others and the end product. T-shaped people are a different breed. To explore an example in more detail, in contrast to the web development scenario mentioned earlier, a T-shaped content developer would be far more than just a writer and idea generator. He or she would excel in the use of web analytics and in the SEO drivers and consequences of various types of content and the structure of content. But in order for a content developer to be such a person, they have to be data savvy and analytics driven. They can’t just be a writer. And that’s what makes being T-shaped so tough. Very few people come naturally equipped with copy writing skills, video skills and an analytical inclination. And even if they do, they rarely have an environment that develops all of those talents simultaneously. As an agency, clients come to us for solutions. And while sometimes, the client may come in the door with a problem that is addressable by a single functional expert, the reality is that their problems tend to be complex and require solutions that are multi-functional in nature. In fact, even if we could solve their problems with I-shaped people and I-shaped solutions, those solutions would be imitable by their competitors. T-shaped people and the teams they form provide answers that I-shaped people can’t. 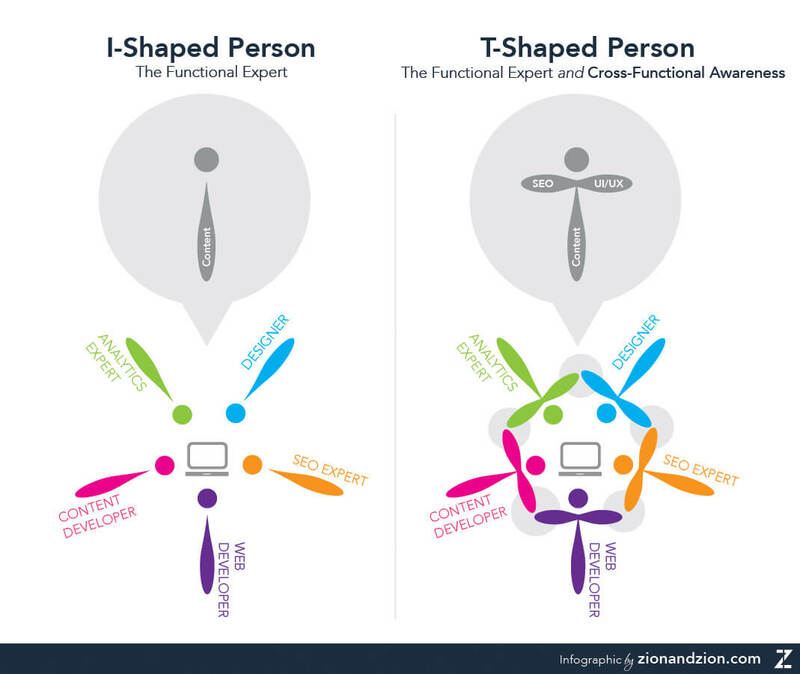 But make no mistake, the development of T-shaped people is a serious, long-term undertaking. It requires people with the right DNA and self-determination to start, but then it requires concerted effort to continue to provide them with the training and resources they need and the type of collaborative environment that nurtures a T-shaped solutions approach.